Bloody footprints, shell casings, trace fibers -- it's just another day at the office for UAlbany senior Danielle Conklin. Conklin, an aspiring forensic scientist and chemistry major, interns at the New York State Police Forensic Investigation Center which not only offers her college credit, but valuable work experience, as well. "Every day is different, and you are able to apply what you learn from classes to your everyday analysis in actual forensic labs," said Conklin of Deposit, New York. 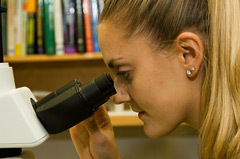 "You are able to apply what you learn from classes to your everyday analysis in actual forensic labs"
"The internship is certainly a phenomenal opportunity for students to participate in real-world forensic and other science activities as a forerunner to a career," said Assistant Professor Jason Shepard, who teaches Conklin's senior-level forensic chemistry courses. At the lab, Conklin worked under the supervision of a team of forensic scientists, including former detective Bradley Brown and Garry L. Veeder. The state police collaborate with UAlbany through the forensic chemistry program in order to train expert personnel who, over the next decade, are needed to fill an estimated 10,000 forensics jobs nationwide. The UAlbany Chemistry Department's forensics laboratory houses instrumentation identical to the actual forensics labs across the street at the Forensic Investigation Center. This mirror laboratory is where the UAlbany chemistry students get their first look into the daily lives of working forensic scientists. With her familiarity, Conklin has led class tours of the actual Forensic Investigation Center laboratory, relaying her experiences to other students.